This is the size frog used in science class for the operation scenes. Most set crew appreciate a fake frog that will lay on the exam table and not smell up the room. Also, they stay shiny, even under strong studio lighting. Great little gag for the film makers' bag of tricks! There is one in stock. We have the molds, so we can make more. If item is not in stock and is to be built, please contact us to check shop's build schedule. How come these aren't cheaper? This is a production mold capable of about 100 quality pulls (copies). 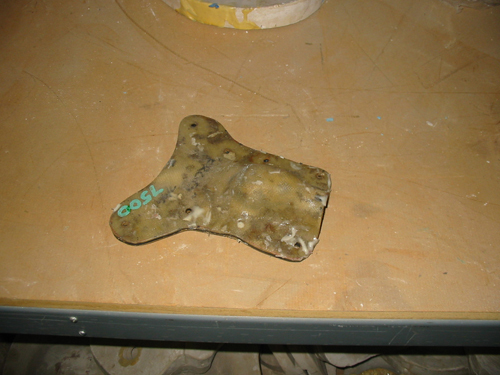 Each time a positive (as shown above) comes out, the mold is degraded just a bit. In order to achieve cheap retail prices, we would have to invest into a metal, high production mold set and pump molten rubber into that mold using a big machine. That technology is expensive and assumes that there is a huge market for this type of prop. There really is not that big a market. This is a film making prop that can also be used as a display in a museum. The detail delivers quality edu-tainment. Many special effects departments and art departments are saving money these days by buying one item, them making their own molds, then making their own copies. This pricing provides those artists with a quality positive to work off of. Visual Effects departments are doing the same thing, but they are scanning the originals, then creating 3D computer models. Both of these departments will save time and money if they have a quality positive in the first place.